The upgrade project for this Buffalo Wild Wings location required three shifts of three-worker crews, working 24 hours a day, and completed in two weeks instead of four or five. Once you’ve installed complete control and audiovisual solutions in seven nearly identical restaurants, it can start to seem like a cookie-cutter operation. 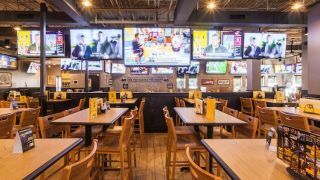 For Union City, NJ-based Serious Audio Video, however, the eighth ELAN control installation in a Buffalo Wild Wings location was anything but standard. Due to the company’s corporate mandate to redesign and upgrade each restaurant every seven years, the high-revenue North Brunswick, NJ location was scheduled to be overhauled in 2017. As any business owner knows, you don’t want to interrupt a profitable operation, which meant that closing the location for four or five weeks was out of the question. According to Casey Johnston, owner of Serious Audio Video, the time constraints made this an extremely high-stress job that required going way above and beyond the normal working call of duty. Fortunately, the site’s ELAN system enabled the upgrade to go as smoothly as possible. Due to the new floorplan and interior design, the team had to relocate dozens of speakers and TVs as well as add 33 new Sharp Aquos display panels, mostly split between 60- and 80-inch models, plus four massive 90-inch models. Integrators know that uninstalling and reinstalling equipment is basically double the work. Six new Crown amplifiers replaced the existing equipment, and a Knoll projector paired with a 110-inch Dragonfly screen capped off the audiovisual portion of the upgrade. For the control side, Serious Audio Video added a new ELAN gSC10 system controller, a S1616A Multi-Room Audio Controller, Xantech IR equipment, a Dell PC, an Apple iPort mount for an iPad with the ELAN app, and a 17-inch Planar touchscreen that provides an interface in the equipment rack.